Inherent fire resistance means concrete structures generally do not require additional fire protection. This removes time, costs, use of a separate trade and ongoing maintenance to applied fire protection. Concrete can offer fire protection greater than that needed for life safety for little or no extra cost. By increasing the fire protection it is more likely that the building can be repaired and be ready for trading again at the earliest opportunity. 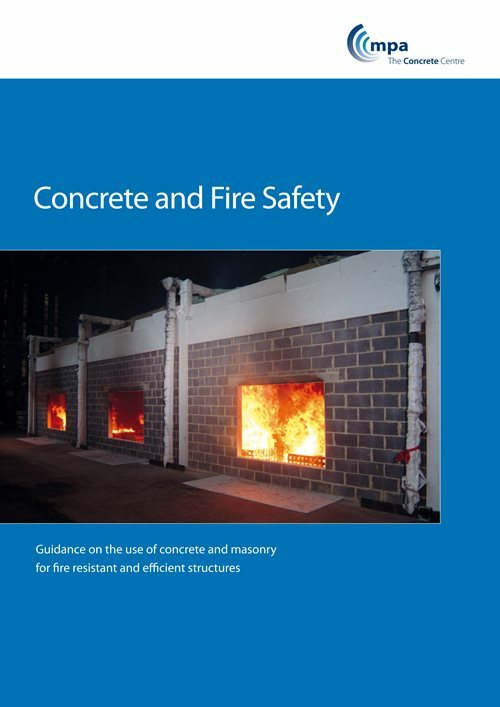 For more information on concrete's performance in fire, see Concrete and Fire Safety publication. Markets and working practices are constantly changing, therefore it makes sense to consider a material that can accommodate changing needs or be adapted with minimum effort. A concrete frame can easily be adapted to other uses. Holes can be cut through slabs and walls relatively simply, while there are methods to strengthen the frame if required. Mechanical and electrical services are an expensive and programme-critical element in construction, with significant maintenance and replacement issues. The soffit of a concrete flat slab provides a zone for services distribution free of any downstand beams. This reduces design team coordination effort and risk of errors. It allows flexibility in design and adaptability in use. A flat soffit permits maximum off-site fabrication of services, higher quality work and quicker installation. M&E contractors quote an additional cost of horizontal services distribution below a profiled soffit with downstand beams of up to 15 per cent. Openings in the slab for service risers can be accommodated simply during design, and formed during casting, or cut later to suit. For the longest spans, wide shallow beam solutions provide large areas uninterrupted by secondary beams, and the freedom to route ducts under the shallow main beams. Concrete offers a whole range of options for meeting the requirements of a particular project. The options outlined below are the most popular for retail buildings. More information on concrete frame solutions can be found in concrete frames and the publication Economic Concrete Frame Elements. Flat slabs are slabs that are supported directly on columns without any beams. They are highly versatile elements widely used in construction, providing minimum depth, fast construction and allowing flexible column grids. Post-tensioning is a method of prestressing that offers the thinnest slab type, as concrete is worked to its strengths, mostly being kept in compression. Longer spans can be achieved due to prestress, which can be used to control deflections. Further information on post-tensioning can be found in the publication Post-tensioned Concrete Floors. Hybrid concrete construction (HCC) makes use of precast and in-situ concrete together, combining the benefits of both to give a robust, durable construction which is fast on site, with an excellent finish. There are many different forms of HCC but a popular option for retail buildings is to use hollowcore units, which are prestressed to maximise the floor span.